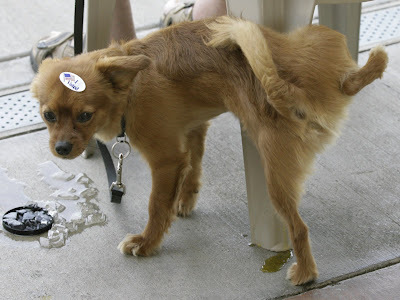 Bakersfield Observed: Who needs polling data when man's best friend weighs in on the California propositions? Who needs polling data when man's best friend weighs in on the California propositions? Sometimes a picture says it all on this voting day in California. Here, "Lucky" makes a statement about the California propositions put forward by Gov. Schwarzenegger. Californian photographer Felix Adamo found Lucky at the Bakersfield Racquet Club polling center around noon. Dan Gassman, Lucky's owner, couldn't say if Lucky supported the propositions or not. The mutt had no comment.